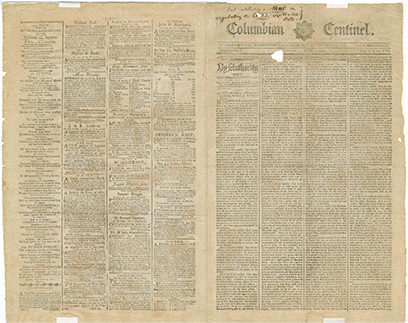 The Columbian Centinel was a twice-weekly paper (Wednesday and Saturday) first published as the Massachusetts Centinel and Republican Journal in 1784 (and by its updated name in 1790) by Benjamin Russell, an innovative journalist who later coined the phrase “Era of Good Feeling” following President James Monroe’s goodwill visit to Boston in 1817. 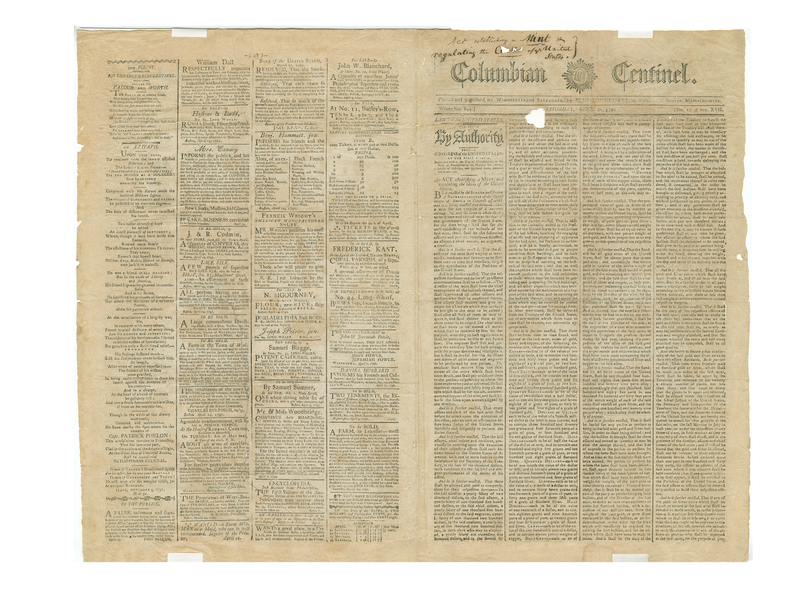 The paper had the largest circulation in the city at the time and was known for its support of Federalism, a political movement that began crumbling at the turn of the century. At the First United States Congress, Russell offered to publish government news, including the Coinage Act, at no charge. 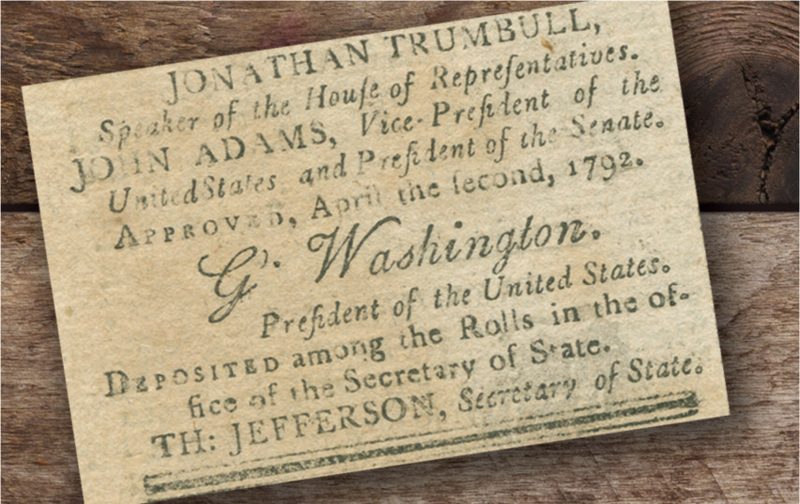 (President George Washington later gave the journalist a $7,000 check when the government’s finances had improved.) 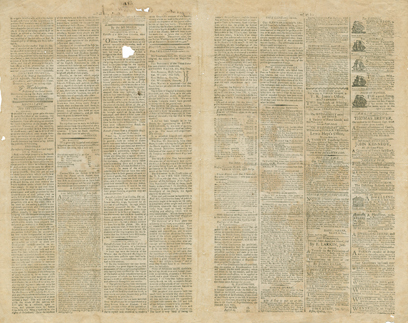 Russell sold the paper in 1828, and it eventually merged with other publications to become the Boston Herald. Bostonians who read this issue of the Centinel likely had mixed feelings about this landmark legislation. Surely it created patriotic pride for some, as the establishment of a national coinage is an important part of independence and a declaration of self-sufficiency. But like other U.S. citizens, Bostonians were comfortable using English, Spanish, Portuguese and state-produced pieces along with Massachusetts paper money, checks and other currency. The country was still in its infancy, and this ambitious legislation undoubtedly was unsettling for some. However, the time had come to establish a national mint, as the absence of a federal currency was hindering economic growth internationally. Federalist leader and first Secretary of the Treasury Alexander Hamilton directed the effort, while Thomas Jefferson argued for a decimal-based system far different than the one used by Great Britain. President Washington agreed, and the Coinage Act, modeled after a report Hamilton presented the previous year, was passed in the first session of the Second United States Congress. 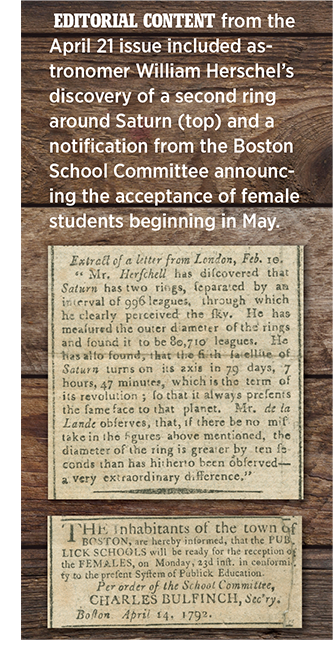 The remaining three pages feature editorial content (including social satire from a contributor named “Ironicus”); local, national and European news (including discoveries about Saturn’s rings and satellites by British astronomer William Herschel); legal notices; and advertisements, some containing woodcuts. 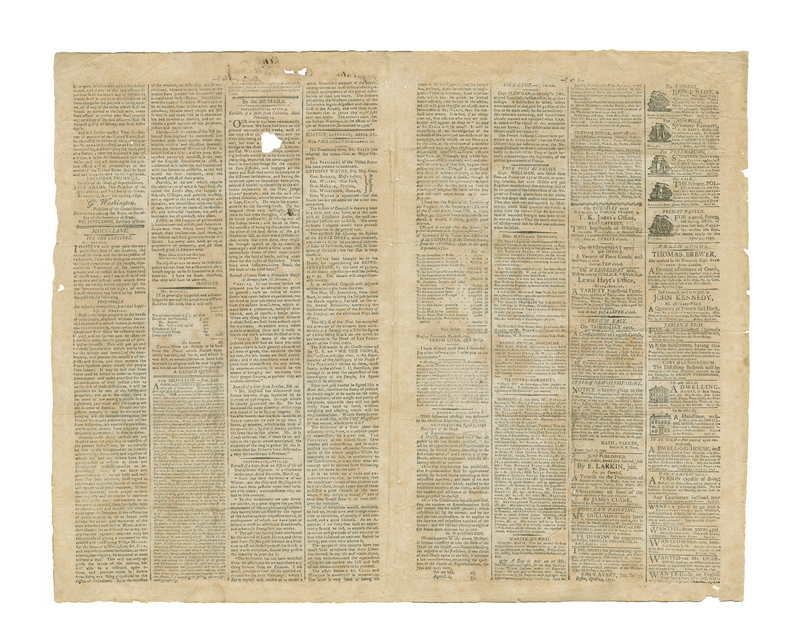 With ads for houses, ships and freight, employment, liquor, tobacco, a wide range of food items, and tickets for the Newport Congregational Church lottery, these classifieds highlight the differences from and similarities to today’s newspapers. 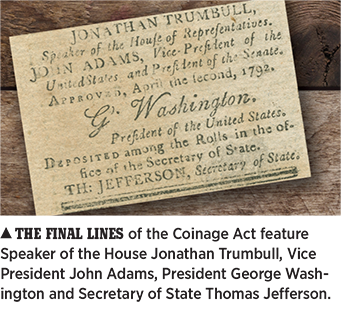 Click Here to view the Coinage Act of 1792. Thanks for the article. I would love to see more of these in the future! Pieces of history we should all strive to learn!!! This is great! I've never actually seen this before. Thanks for a great history lesson! WOW!! What a piece of important US history!